A bio sketch is available for Suzy in the People section of the web site. GOODRICH, Suzanne D. 11/9/1938 - 10/1/2014 Ann Arbor, Michigan Suzanne D. Goodrich was born November 9, 1938 and passed away October 1, 2014. Suzanne held both undergraduate and graduate degrees from the University of Michigan, and contributed both time and resources to further the University's work. She was a computer analyst and retired from the University of Delaware in 1997. She was preceded in death by her husband Raymond F. Goodrich, her sister Marie D. Bearden, and her brother Joseph Dinga. She is survived by her children; Andrew, Thomas (Colleen), and Barbara Goodrich, her granddaughter, Elizabeth Goodrich, and her sister's husband Bill Bearden, his children, grandchildren and great-grandchildren. She loved Ann Arbor deeply and started planning for the Art Fair and Summerfest months in advance. An advocate for environmental causes, she founded the Raymond F. Goodrich Preserve, N. Dixboro Rd. Ann Arbor Charter Township where a combination dedication and memorial service will be held on November 15th at 1:00 PM. 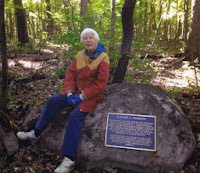 In lieu of flowers, contributions in Suzanne's memory can be made to the Washtenaw County Natural Areas Preservation Program. Published in the Ann Arbor News from October 20th to 23rd, 2014.